BB1 now positioned at the M.P./U.P. border, about 150 kms W/NW of Rewa. At a pressure of 996 mb, the system is maintained its designation. Movement is slow and steady. Though not precipitating unusually heavy rains in its path. Its movement in the next 24 hrs, presumably W/Nw, will precipitate rains in west M.P. and lesser amounts in in adjoining Rajasthan , and eastern Gujarat. I anticipate a SW flow of moisture towards the system, as it moves west, from the N.Konkan coast. 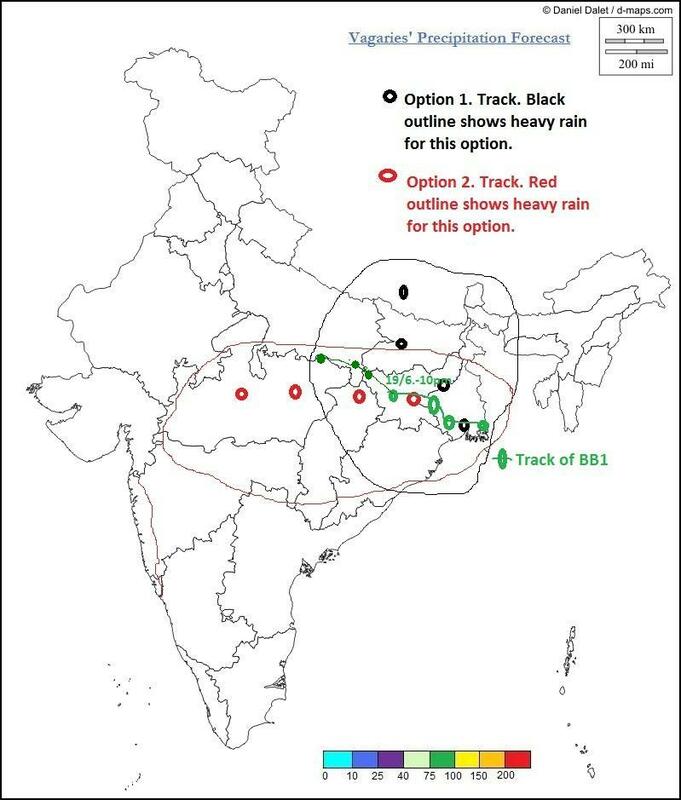 The location and positioning of BB1 would be such, that with the off shore trough organising along the konkan coast, the SW winds would be activated towards BB1. Precipitation would increase along N.Konkan and in the ghat regions from Tuesday night or Wednesday. Mumbai could have more frequent showers on Wednesday, with overcast conditions and strong SW winds. 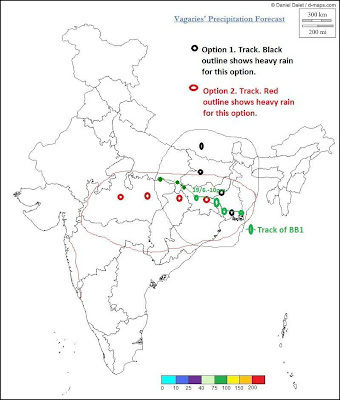 Rainfall would amount to around 40 mms . The writer is currently in Mahableshwar (since Monday), and frequency and posting of detailed blog, becomes difficult. Will be back in Mumbai on Thursday, and most probably with a posting on Thursday night. Queries would be answered then. Mumbai is not windy yet though the cloud mass is over West MP. Very sultry conditions in the morning. Lakhs of daily commuters have taken a steam sauna bath in the local trains.